« The most un-appreciated attraction at Walt Disney World…. 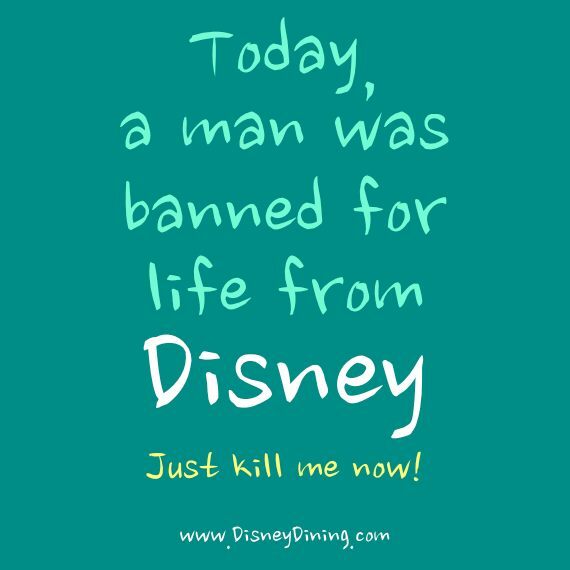 Today a man was banned for life from Disney!!! A Walt Disney World “urban explorer” has been banned from the park – for life. The “explorer,” who goes by the name “Adam The Woo,” gained an online following by posting videos of himself sneaking into backstage areas of the Magic Kingdom off limits to the public. On his YouTube channel, he has a dozen videos of himself “exploring” Disney World. The park considers what he did trespassing. In his latest video, Adam, who is wearing a black Mickey Mouse T-shirt, says he’s “had better days” since he was met by security on his latest visit to the happiest place on earth and banned for life. Adam, who is upset about the ban, claims the security guards that got him were actually fans of his videos. A spokeswoman for Disney World tells Fox 4 they take matters like this seriously and filed a trespass warning against Adam because he “deliberately entered unauthorized areas” several times before. This entry was posted on January 16, 2013 at 6:34 PM and is filed under EVERYTHING DISNEY with tags Man banned from Disney for life. You can follow any responses to this entry through the RSS 2.0 feed. You can leave a response, or trackback from your own site.